Like the red yarn that ties rawhide strips together on a baseball, the lore and tradition of the National Pastime knits the sport firmly into the fabric of American culture and the consciousness of American small towns. The Stockton Ports enter into their 64th season in the California League in 2013, with a 4,889-4,167 overall record, 11 league titles, and their own unique lore and traditions tying them into Minor League Baseball and Californian history. Baseball lore credits Abner Doubleday, an important Union general who played a pivotal role at the Battle of Gettysburg, with inventing baseball in a cow pasture in Cooperstown, N.Y. in 1839. Baseball lore also credits a baseball team based in Stockton, C.A. with being the inspiration for Ernest Lawrence Thayer's famous "Casey at the Bat" poem. Thayer wrote the fictional poem in 1888, as legend goes, after seeing the Stockton club perform. At that time, Stockton played at Banner Island Park near a riverfront area called Mudville. Just as the Mills Commission Report elevated Cooperstown into baseball prominence, a short poem by Thayer placed Stockton indelibly on the baseball map. That 1888 Stockton team won the California League pennant, finishing the season with a 41-24 record. In the early 1900s, Stockton boasted a team in the California League. While the team underwent several name changes (Poppies from 1903-05, Millers from 1906-08, Tigers in 1909 and Boosters in 1910), the team found plenty of success. Stockton won pennants each season from 1903 to 1908. In 1913, the California League reemerged and Stockton captured another title. In 1915, the League folded. Baseball in Stockton did not reappear until a new California League, a Class C league, was founded in 1941 by Bill Schroeder. The Stockton Fliers became a charter member, along with franchises in Anaheim, Bakersfield, Fresno, Merced, Riverside, San Bernardino, and Santa Barbara. 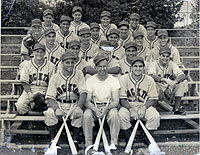 Because of the outbreak of World War II, Stockton did not field a team in 1942, and the League suspended play because of the War. In 1946, the League resumed normal operations, with the Stockton Ports as a member. 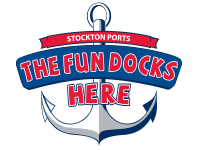 The club was named the Ports because Stockton is the state's only inland port. The Ports called Oak Park Field home, but renamed the stadium Billy Hebert Field in 1950, in honor of a local man who became the first player in organized baseball who was killed in action during World War II. Hebert actually played for Merced in 1941 before enlisting in the Navy. He was wounded at Guadalcanal in October 1942. In 1946, the Ports finished first in the California League with a 78-52 record and their first of 11 California League titles. In 1947, the Ports captured their second championship, as one of two teams in the League that were not affiliated or owned by a major league team. The Ports did have a limited agreement with the Oakland club in the Pacific Coast League. To capture the title, the Ports went on a 26-game winning streak-a streak that remains a League record and is the second longest winning streak in baseball history. The Ports, led by manager Johnny Babich, finished the season with a 95-45 record, 16 full games ahead of San Jose and Visalia. The back-to-back championships makes the Ports one of four teams to win consecutive titles. Baseball historians Bill Weiss and Marshall Wright ranked the 1947 Ports among the top 100 greatest Minor League Baseball teams, placing them at No. 98. In 1947, the League expanded to include teams in San Jose and Ventura. Today, there are 10 teams in the California League, with five in both the Northern and Southern Divisions. The Northern Division is made up of the Bakersfield Blaze, Modesto Nuts, San Jose Giants, Stockton Ports and Visalia Rawhide. The Southern Division is composed of the High Desert Mavericks, Inland Empire 66ers, Lake Elsinore Storm, Lancaster JetHawks and Rancho Cucamonga Quakes. Since joining the California League in 1941, the Ports remained with the League until 1972, and returned in 1978. During the 1980s and into the '90s, the Ports were one of the nation's winningest Minor League Baseball teams, totaling 977 wins through the 1991 season. The Ports also had the best win-loss percentage in all of Minor League Baseball for the 1980s. After the 1999 season, the team renamed themselves the Mudville Nine, as a salute to Thayer's poem and their own roots. 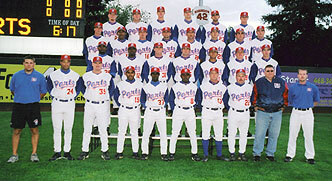 Following the 2001 season, the Nine reverted back to the name Ports and continued to find plenty of success in the California League. In 2005, the Ports moved from Billy Hebert Field into their spacious new home at Banner Island Ballpark, which is located right along the muddy riverfront. Ports affiliates over the years... 1941 Los Angeles (PCL); 1946 Independent; 1947-48 Oakland (PCL); 1949 Chicago AL; 1950-51 Independent; 1952 St. Louis AL; 1953-54 Chicago NL; 1955 Oakland (PCL); 1956-57 Baltimore; 1958 St. Louis; 1959-1971 Baltimore; 1972 California; 1978 Seattle; 1979-2000 Milwaukee; 2001-02 Cincinnati; 2003-2004 Texas; 2005-present Oakland.